In the blink of an eye, it’s already Week 3 of the One Room Challenge! We’ve reached the halfway point, which is both exciting and terrifying. This past week I managed the project from down in North Carolina while we sourced and gathered inspiration at High Point Market. Sandwiching in a 5-day business trip during the ORC was not ideal, but we can’t ignore our other projects, plus I was hopeful to find a special piece or two for my client’s guest retreat. (Didn’t buy anything, but I’m still thinking about a couple of things I saw.) Thankfully, much of the drama of the first two weeks has been resolved, and our GC, Buono Construction Group, is making significant headway with renovations in both the bedroom and the bathroom. Unfortunately we’re mid-construction in both rooms, so I don’t have a whole lot to show you just yet, but I can dish a bit more about what we have planned. In developing our scheme for this room (see last week’s post for details), we had already decided that wallpapering the entire room would be a big element. As we mentioned before, this room has a total of 6 doors, which doesn’t leave a lot of wall space. Two of the doors are original, with beautiful trim details and we plan to leave them be. The other four doors were not consistent with the rest of the house, so we decided to make them “disappear” with wallpaper. 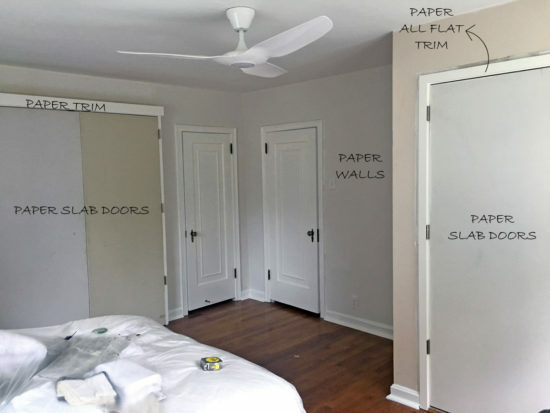 We hung new slab doors on both closets which will both be papered, to help them blend into the walls. 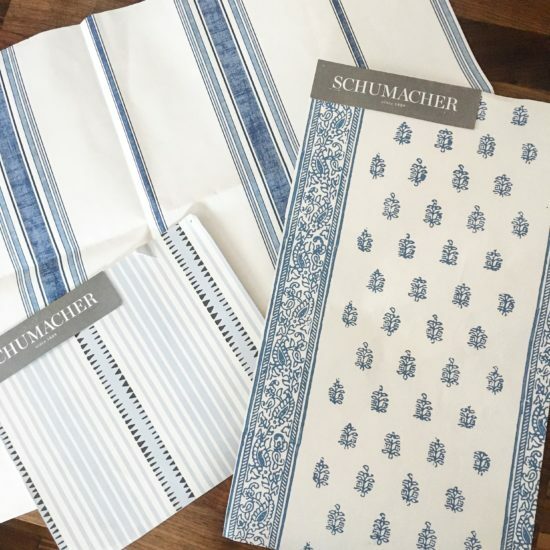 We knew we wanted a blue & white stripe paper, but the questions was – would it be a classic stripe, or would it be a little funkier? Below are the three options we narrowed down for our client to choose from. We had a definite favorite (which predictably was the most expensive option! ), but you’ll have to wait till next week to see which one the client selected. I’m curious to hear – which pattern do you prefer? If you study our Instagram stories today you will be able to see which one we chose. With the floors being a more dominant pattern, we plan to keep the walls very simple. They’ll be a white subway tile with a special stripe running around the top of the shower. I think a little detail will go a long way here – after all, the subway pattern is pretty graphic on its own even with a lighter grout. I plan to swing by the house today to see tile progress and I’m pretty excited! On the bedroom front, not much to show – but things have been ordered, and the new ceiling fan has been installed. Having the fan installed early-on was key, as I ideally wanted it in place before I finalized the height of the canopy bed. We had to be mindful of the height interaction between the fan and the bed’s frame. I didn’t want a combination that would be physically or visually crowded, so being able to see the fan in place was a help. We chose this sleek Haiku L Series ceiling fan from our sponsor Haiku Home. 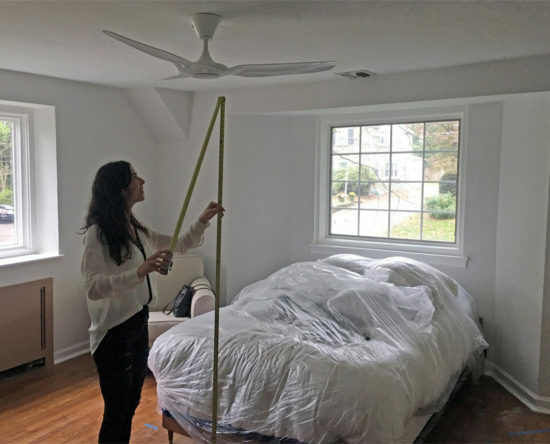 Our client requested a fan, and I have to admit that I often have a hard time finding a fan I like – especially with a light option. This one is great, though – it is contemporary, clean, and has elegant lines. It has a light, along with simple, easy to use technology. Plus at less than 12″ off the ceiling, I can fit my bed comfortably below it! 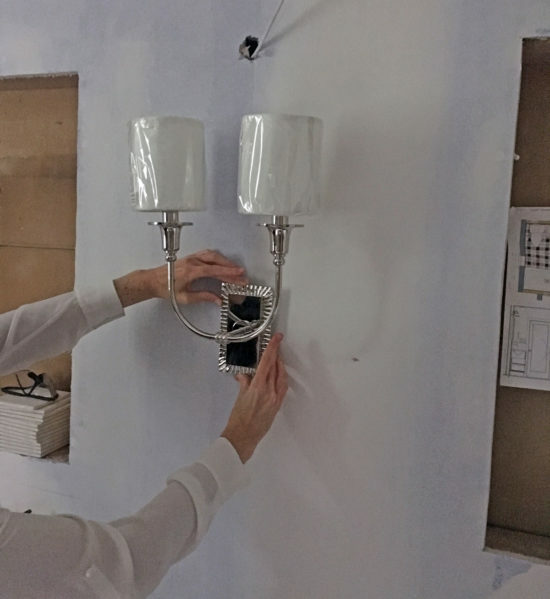 With bathroom tile work in progress, we’ve started turning our attention to some of the finishing details, including this sconce from our sponsor Lamps Plus. Now that our medicine cabinets have been framed in, I can properly pick a good height for our bathroom sconce. I’m really loving the traditional detailing of this Dover Wall Sconce by Hudson Valley. It feels a little bit embellished and traditional, but not so ornate that it can’t work in a contemporary space. I knew we needed a great transitional piece for the lighting. With the plaid tile floor feeling a bit more masculine, this sconce provides a good feminine balance, and it’s always all about the balance for me! Next week should be an exciting week for progress – wallpaper will be hung in the bedroom, and the bathroom vanity will get installed. We plan to dive into our furniture and fixture selections. Remember our canopy bed conundrum? Well, we have a solution. It may be a temporary solution, but let’s just say that I’m super grateful to our sponsor, The Mine! Between the bedroom and bathroom, we’ve had a lot of products to source and order. I’ve been making my lists and checking them obsessively. With only three weeks until the reveal, it’s super important that I get those last minute orders placed. My head is swirling, but I feel like we are in a good place right now. Fingers crossed that I can keep my cool and that the logistical gods will be kind to us. I love the floor pattern option #1! And I love your concept for hiding the doors. It’s so fun to see what options you end up with…truly stunning! Can’t wait to see which paper option they chose!! I love Option #1 as well, but I’m looking forward to seeing your final selection. And your light fixtures are simply beautiful as well. Best of luck with the rest of your ORC! 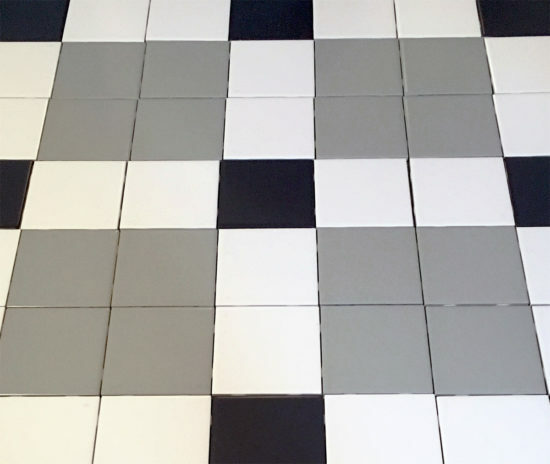 Tile pattern #1, by a landslide. I think tile option #1 makes it look most like plaid. With respect to the wallpaper, I like the 2 in the back the most. It is coming right along! Can’t wait to see the bed and the bathroom tile. I like option 1, by the way. And papering the doors will be awesome!! 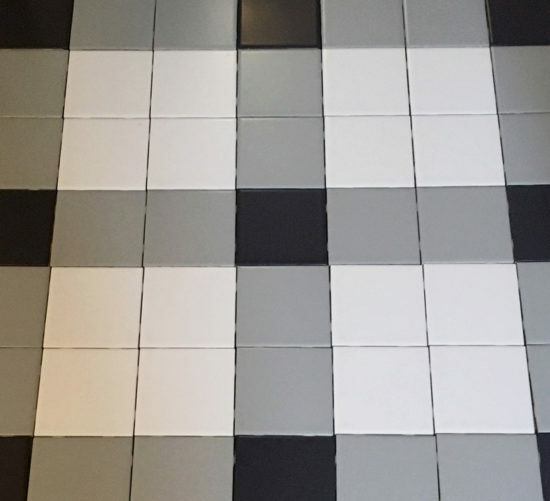 Tile option #1- #2 doesn’t make sense The darkest tile is supposed to represent the cross-section of the “lines” if the lines are both white, then the “cross section” would also have to be white. If it was a blue line and a yellow line then the “cross section/ darkest tile” would be green. If it was a white line and a blue line, then the “cross section” would be a lighter blue. Cant wait to see the wallpaper!